This picture is usually seen as the dominant composition of Picasso's Rose Period - the conclusion of developing style, colouring and themes to date. A massive canvas, in fact the largest that Picasso ever worked on at 212.8x229.6cm, (7x8 ft), it was the outcome of several preliminary studies, including elements taken from Young Acrobat on a Ball (1905). The background was originally a racecourse until Picasso created this barren landscape, which is reminiscent of his birthplace in Andalucia, southern Spain. 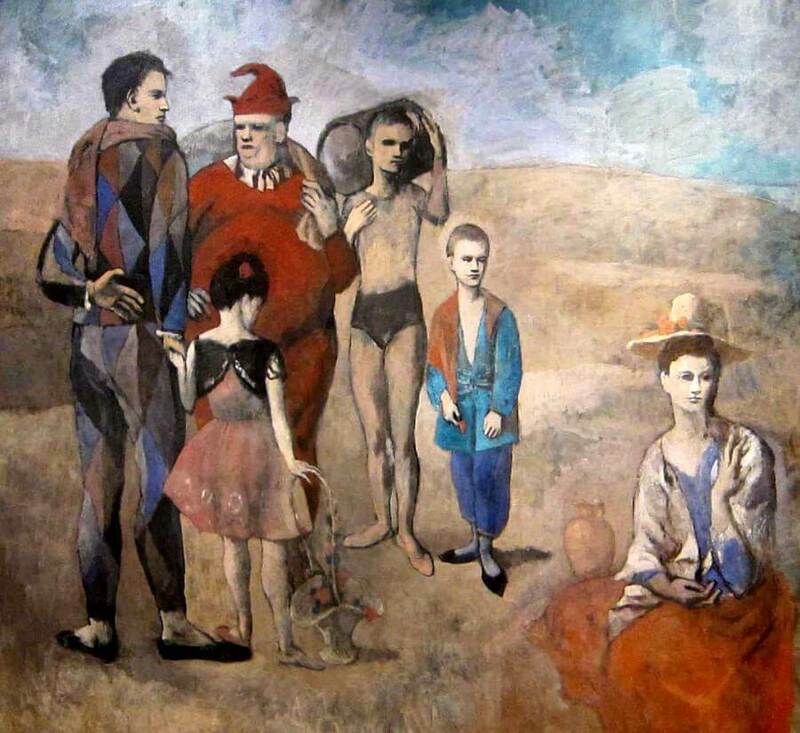 The circus troupe is assembled as if departing, both literally and metaphorically, in terms of Picasso's development. 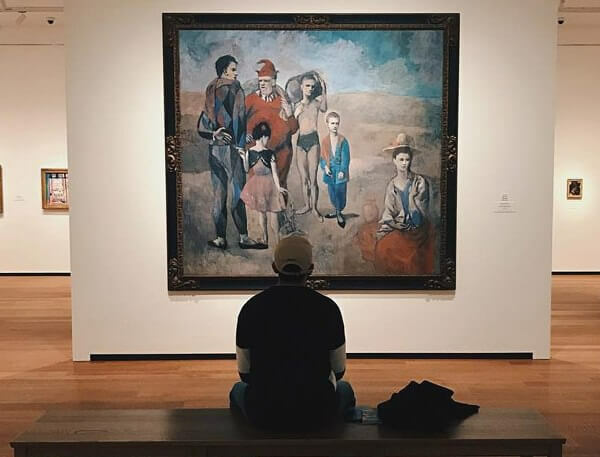 Picasso is again Harlequin, holding the little girl, possibly his beloved younger sister, Conchita, whose tragic death from diphtheria at the age of seven affected Picasso deeply. He bargained that he would never paint again if she survived, so her death created his first obsessive, recurrent connection between art, life and death in his work. The paunchy jester is the Symbolist Apollinaire, and the older boy-acrobat is either the poet Max Jacob or the poet Andre Salmon. Picasso's lover of the time, Fernande, is probably the woman strangely separated from the group. The fresco-like colours create the haunting mood of this deserted landscape, a dislocated pastoral scene emptied of life except for the figures, and also oddly separated from the traditional 'big-top' setting. As several critics have remarked, it has instead much in common with Manet's monumental, frieze-like composition of 1862, The Old Musician. This was included in the Manet retrospective held in the Salon d'Automne in 1900, and the fortuitous similarity in subject matter would surely have attracted Picasso's attention, prompting perhaps his final concerted effort to simplify and abstract his composition. Manet had often been accused by Salon critics of painting 'incomprehensible' pictures since no one was able to identify a coherent or consequential narrative within them. Some critics complained: 'There is much that is arbitrary in his compositions', and other contemporaries dismissed Le Déjeuner sur l'herbe as 'an uncouth riddle'. The Old Musician is one of Manet's least conventional compositions and the interpretation of its imagery continues to exercise and divide scholars. Inconsequentiality or 'arbitrariness' is the hallmark of Family of Saltimbanques, and it may have been Edouard Manet who gave Picasso the courage to compose as casually on so imposing a scale.